Clutch is a B2B ratings and reviews platform evaluating over 7,000 companies across 500+ industry verticals ranging from UX design agencies to phone answering services. Their objective is to match the buyers and sellers on their site in order to harbor fruitful and successful business relationships. 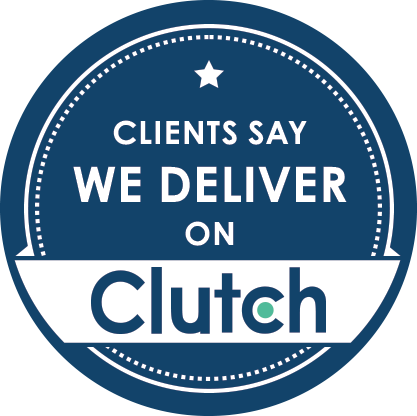 The root of Clutch’s analysis rests in client interviews, where their team speaks with a company’s references on the trials, solutions, and outcomes of their time working together. Intertwined, Clutch incorporates a multi-faceted scoring methodology that takes into account a company’s market presence, industry recognition, and clientele. They are thereby able to identify top performing players in an industry, providing buyers with a complete, objective view of the business landscape. explained the Executive VP of IT for a private life insurance company. “They have an extraordinary ability to do research. They don’t just design in a vacuum; they truly solve user needs. A lot of places claim to have that skill but don’t do it well or rely on a single technique…that kind of adaptability and expertise is exactly what we wanted.”– product manager for marketing consulting firm. To learn more about our clients’ experiences visit our Clutch profile here. To get in touch with us to help work on your next project contact us here.